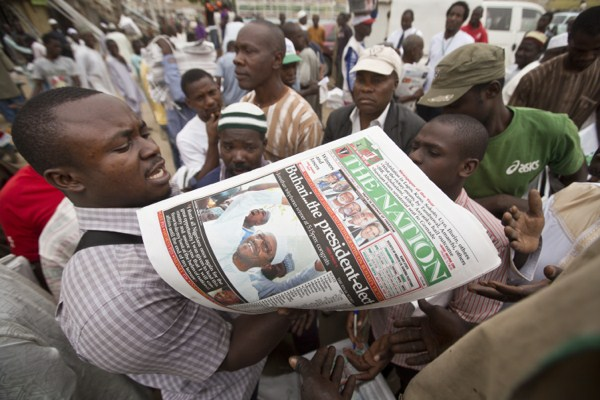 A newspaper distributor counts copies to give to eager sellers the morning after the presidential election, Kano, Nigeria, April 1, 2015 (AP photo by Ben Curtis). After a six-week election delay in February, Nigerians went to the polls last weekend. To the surprise of many, they voted out an incumbent, President Goodluck Jonathan, who faced growing criticism for failing to address corruption, poverty and the threat of the militant Islamist group Boko Haram. Jonathan was defeated by 72-year-old Muhammadu Buhari, a retired general who led a successful military coup in 1983 and, more recently, was runner-up in the previous three presidential elections. Buhari’s decisive victory, which relied on substantial support from northern and southwestern Nigeria, was the first electoral defeat of an incumbent president in Nigerian history.